The man behind Florida's medical marijuana initiatives is considering a run for governor and now wants to legalize it, a battle over medical marijuana is looming in Indiana, a new report says the Mexican military is getting away with murder in its US-backed drug war, and more. Colorado Towns Approve New Pot Taxes. Voters in several localities approved proposals to set new marijuana taxes on Tuesday. Eagle County approved new sales and excise taxes that will start at 2.5% and increase to 5%. The town of De Beque appoved a 5% sales tax, while Longmont approved a 3% tax and Berthoud a 7% one. Florida Attorney, Possible Gubernatorial Candidate, Says Legalize It. Florida attorney John Morgan, the man behind the state's medical marijuana initiatives, is considering a run at the Democratic gubernatorial nomination and he says he's ready to legalize marijuana. "As to marijuana itself -- and I've kind of evolved to this point -- I believe now that the real answer is that we should just legalize marijuana, period, in America," he said in an interview with WUFT TV. "There's so many kids, young people, whose lives are ruined forever for possession of marijuana. And you get arrested, yeah, you may not go to jail, but that may be the end of West Point, that may be the end of law school, that may be the end of getting this university, it may be the end of that job." Indiana Battle Lines Forming Over Medical Marijuana. A group of military veterans advocating for medical marijuana is holding a news conference today to make their case for legalization, but they're facing opposition from the state's county prosecutors, who have urged state leaders to resist legalization "in any form, for any purpose." In making their case, the Association of Indiana Prosecuting Attorneys deployed Reefer Madness-style rhetoric, writing that "despite claims of the contrary, the legalization of marijuana could further exacerbate Indiana's opioid epidemic," and, "that information purporting that marijuana is medicine is based on half-truths and anecdotal evidence." 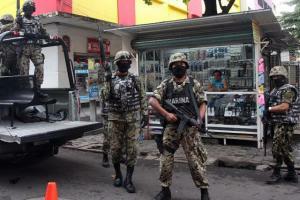 Backed by US Anti-Drug Funds, Mexico's Military is Getting Away With Murder, New Report Charges. A new report from the Washington Office on Latin America (WOLA) charges that the Mexican military is resorting to torture, sexual violence, extrajudicial executions, and forced disappearances as it pursues its fight against drug trafficking organizations. Rampant violations go unpunished, and the report exposes a culture of impunity and a lack of transparency within the military. "Violence has increased in the country while human rights violations persist, the urgency and pressure to pass reforms to strengthen the civilian police force has decreased, and accountability has been virtually nonexistent," the report noted. Norway Lowers Penalties for LSD Possession. Hearing an appeal from a man sentenced to five months in jail for possession of LSD for personal use, the Supreme Court has instead sentenced him to 45 hours of community service, setting the stage for a more general relaxation of penalties for LSD possession for personal use.